Apple has updated its online store today to indicate that AirPods are now estimated to ship in four weeks in the United States, Europe, and many other regions, down from a six-week estimate listed since launching in December. Apple hasn't disclosed AirPods sales numbers, but CEO Tim Cook has routinely said demand continues to significantly outweigh supply. Earlier this week, he revealed that Apple has increased production capacity for AirPods, which has perhaps led to the quicker turnaround time now quoted. We're also seeing incredible enthusiasm for AirPods, with 98 percent customer satisfaction based on a Creative Strategies survey. We have increased production capacity for AirPods, and are working very hard to get them to customers as quickly as we can, but we are still not able to meet the strong level of demand. In late December, a few weeks after AirPods launched, Cook said the wireless earphones had been "a runaway success," contributing to a "great holiday" season. Cook cheerfully noted that Apple is making them as fast as it can. AirPods are Apple's first pair of truly wireless earphones. They instantly turn on and connect to your iPhone, Apple Watch, iPad, or Mac when taken out of their charging case, thanks to Apple's custom W1 chip. Likewise, audio automatically plays as soon as you put them in your ears and pauses when you take them out. AirPods are controlled mainly by Siri. Doubling tapping an earpiece invokes Siri, and voice commands can be used to adjust the volume, change the song, make a call, and so forth. AirPods deliver up to five hours of listening time on one charge, and a 15-minute fast charge provides up to three hours of listening time. 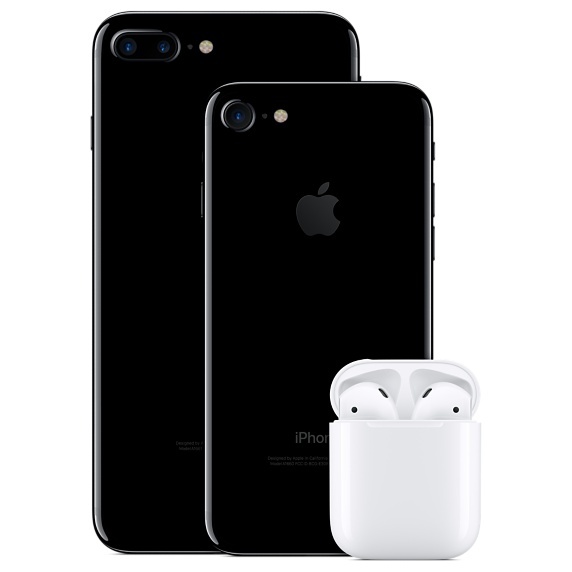 AirPods have received largely positive reviews, and they earned a 98 percent customer satisfaction rate in a recent Creative Strategies survey. AirPods can be ordered on Apple's website for $159 in the United States. They're also frequently in stock at resellers such as AT&T and Verizon with delivery to most U.S. addresses in as little as 2-5 days. Guys, are they really that good to still be this constrained? Yes, they are that good and in my opinion, and are game changers. If you haven't experienced them, you should. They are incredibly well made with excellent features and the battery life is outstanding. This was best purchase I made from Apple in 2016 over my devices from Apple. The best product Apple released in years. No joke, out of all of my Apple devices (incl the 2017 Macbook Pro touchbar) I like my AirPods the most. This is one Apple product I am 100 % happy with - highly recommended! AirPods are fantastic. The size, the charging case, W1 chip, battery life, sound etc all make it such a great product. Don't worry, some people have way too much money and time on their hands. More like Apple made a great product that performs seamless with the iPhone. Furthermore, the competition is priced higher than the AirPods, and at a $160, the AirPods offers a lot of functionality. Apple hasn't disclosed AirPods sales numbers, but CEO Tim Cook has routinely said supply continues to significantly outpace demand. Shouldn't that read demand continues to outpace supply? I agree. They look to be the most uncomfortable, and easily lost device of their type. The choice of white is also questionable cause they look silly in the ear. I Actually find them very comfortable. But obviously every ear is different and not everybody will have the same results. Also, I don't find the white to be very offputting. Although, I would like to see a black option. Lastly, I don't think they look "Silly" in the ear. What's the difference between the wired EarPods that are exactly the same, with the exception of wire missing with the AirPods? They are almost identical. 1. With 1 in my ear and 1 out of my ear, but not in the case, music still seems to stream to both AirPods. This messes with the stereo output. I have to physically put the unused one back in the case to get stereo out of one side. With 'auto ear detection' I don't see why it operates this way. 2. Occasionally, pulling the 1 AirPod out of my ear doesn't actually stop the audio, so listening to an audiobook gets frustrating because it keeps playing and it's hard to figure out where I actually left off. 3. I thought auto-pairing would be a bit nicer. Switching between watch/phone/ipad should be more seamless. While it auto-pairs to the iPhone correctly about 95% of the time, if I pair manually to my iPad, and later try to pair to the phone, I always have trouble. Just thought W1 would be cleaner than it is. 4. Double-tap to play/pause only works intermittently. Seems the app being used behaves differently. Some apps will play with a double-tap, but not pause, others pause but won't play. I think Apple Music is the only one that reliable plays and pauses with double-tap. 5. Wish you could slide your finger up and down the side to raise or lower volume, like a touch panel. Having an Apple Watch makes control with Now Playing MUCH better. I can't imagine liking the AirPods as much without an Apple Watch. How do I put it nicely ... you cannot complain about a product that you’ve only used with beta software. Comfort is dependent on the user ear shape and size, how often they are lost depends on the clumsiness of the user and the ‘they look silly’ joke lasted all of two weeks post-launch. Those looks jokes tend to fade when the product gets a 98% customer satisfaction notch on its belt.